Nearly 100 Miles a Day by Biking and Vanpooling! Because I live in Portland and work in Salem, I have a long commute, but I like to combine biking and vanpooling. So I bike to the vanpool pick up spot, then hop in the vanpool to Salem. About how far is your Super Commute each way? I ride my bike four miles (one-way), then the vanpool is 45 miles one-way. So, each day, I ride my bike eight miles, then vanpool 90 miles! 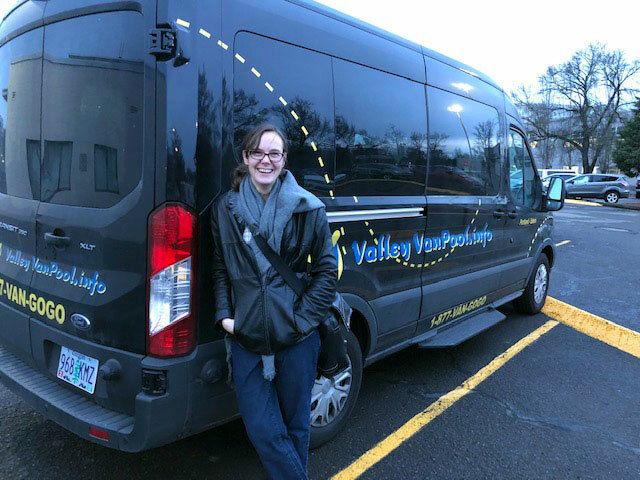 What is your favorite thing about your combination of biking and vanpool? I get daily exercise on the biking part, and then I have Wi-Fi on the van, so I’m able to get online and work or do other stuff. I also really like all the people I ride the van with. Do you have any special tips for anyone who wants to walk, bike, ride the bus or carpool on a regular basis? Since I have a combo type of trip, I purchased a special folding bike when I got the job in Salem, so I could ride to the vanpool then bring my bike to Salem and ride there too. Then when I want to duck out for lunch or an offsite meeting, I can unfold my bike and ride. Are there particular parts of your route that you really enjoy? Are there particular parts of it that you don’t enjoy as much that could be improved? The bike ride in the morning when Portland streets are quiet is great. Also the sunrise over the mountains to the east of I-5 on the way down to Salem is always beautiful (when we can see it through the clouds). I do not love the traffic on the van home to Portland but the time goes by pretty quickly when I can work on the computer or listen to an interesting podcast. Is there a particular reason why you choose ride your bike and vanpool? Vanpool saves time and money and is better for the environment than driving alone. Biking is healthy, cheap, and good for the environment. That’s it! For the biking portion, I wear waterproof gear for biking in the rain (it is Portland, after all) and generally a scarf and gloves in the winter. Any other thoughts, inspiration or things that you want people to know? The commute would be pretty difficult for me if I didn’t have the bike/vanpool combo. Between the exercise and the time is saves me (reclaimed time by not having to be focused on the road and driving), I would not be able to make the commute work without these options.